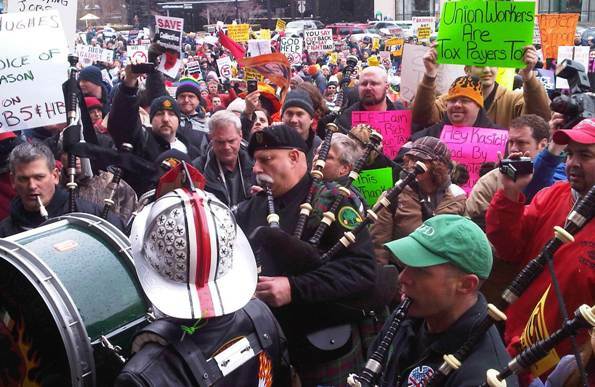 Union members protest in Columbus, Ohio, against an attempt by Republican Governor John Kasich to strip collective bargaining rights from public employees. Wisconsin Republican Gov. Scott Walker is now threatening to lay off thousands of state workers if he is unable to ram through legislation that would terminate collective bargaining rights for nearly all Wisconsin state workers. The attack on unions, however, is not limited to Wisconsin. Republican lawmakers in Indiana voted late last week to advance House Bill 1468, which would put Indiana on a fast track to outlaw union security clauses. In Ohio, GOP Gov. John Kasich is pushing SB 5, a bill that would strip collective bargaining rights from Ohio public employees. And in New Hampshire, the House of Representatives voted overwhelmingly last week to make New Hampshire the first state in the Northeast to enact a “right-to-work” law. The 221-131 vote in the N.H. House sends the controversial bill (HB 474) to the state Senate without the two-thirds super majority that would be needed to overcome a potential veto from Democratic Gov. John Lynch, who strongly opposes it.